Thanks to list member Clarice M.H. who told me that "The Night Before Christmas in Texas, That Is" was written by Leon A. Harris - a student teacher she had. Clarice wrote, "Knowing my fondness for this poem, (he) gave me a book of it which I still have. Harris copyrighted the poem in 1952. My book is dated 1977." Thanks for letting us know Clarice. So thanks to Heather for her Australian adaption of Leon. A. Harris's "The Night Before Christmas in Texas, That Is"
Way down on the beach, without any snow. For this was Australia, What more need be said? A loaded up ute, Come on at a run. There'll be plenty of travelin' for you-all tonight..
Had a bright red sun hat on the top of his head. with his beard so curly and white. "Am I the real Santa? Well, what do you think? 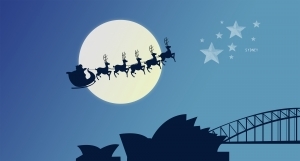 g'day CHILDREN OF Ausie-MERRY CHRISTMAS cooee!